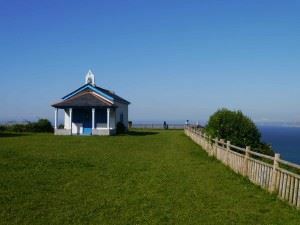 The village is on the coastal route of the Camino de Santiago – and we saw quite a few pilgrims passing through. 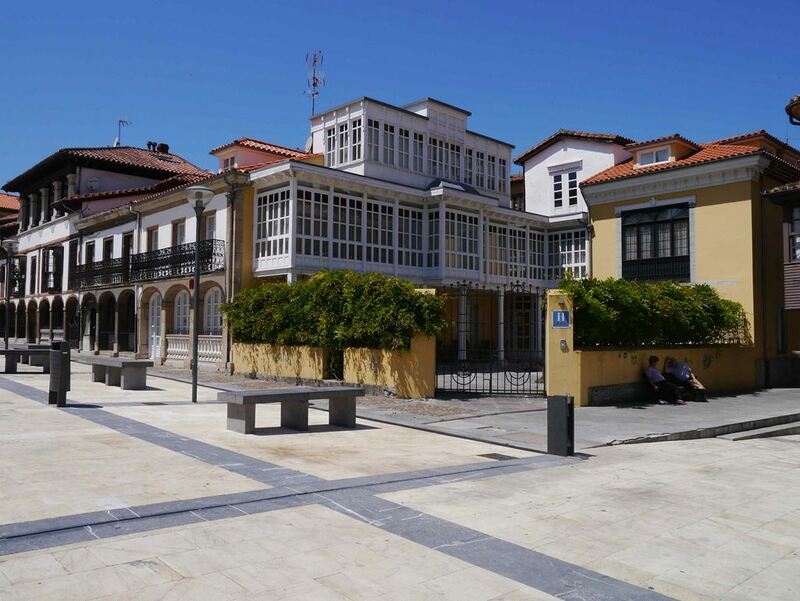 It’s a beautifully well-kept village with a great many casas indianas – or colonial houses. 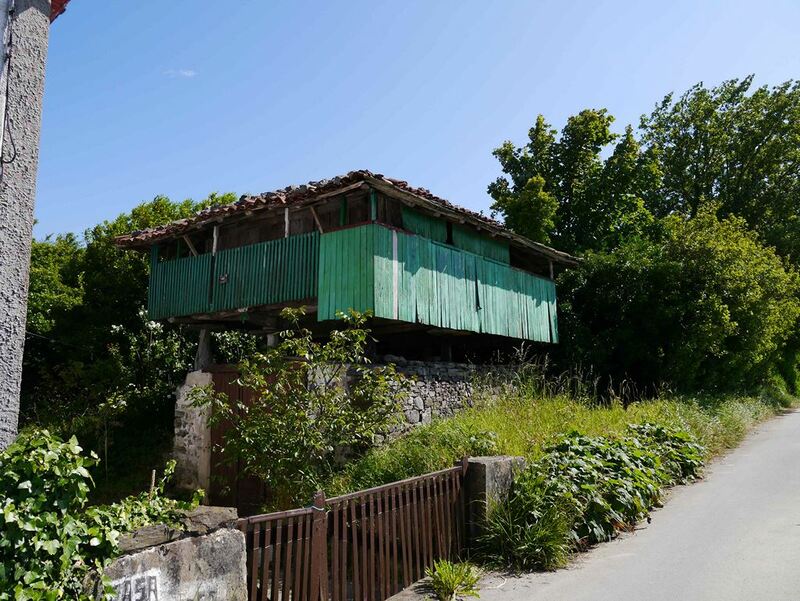 We were also struck by the hórreos – raised granaries – which are wonderful and beautiful structures still in use. We loved the wonderful gardens in the village with hydrangeas growing everywhere. Cadavedo is home to the Regalina – a wonderful hermitage from 1931. The view from here onto the beach is spectacular. The larger of the towns in the area – we enjoyed the many walks alongside the port plus the atmospheric narrow streets full of traditional shops selling ciders, cheeses and homemade pastries and pies. 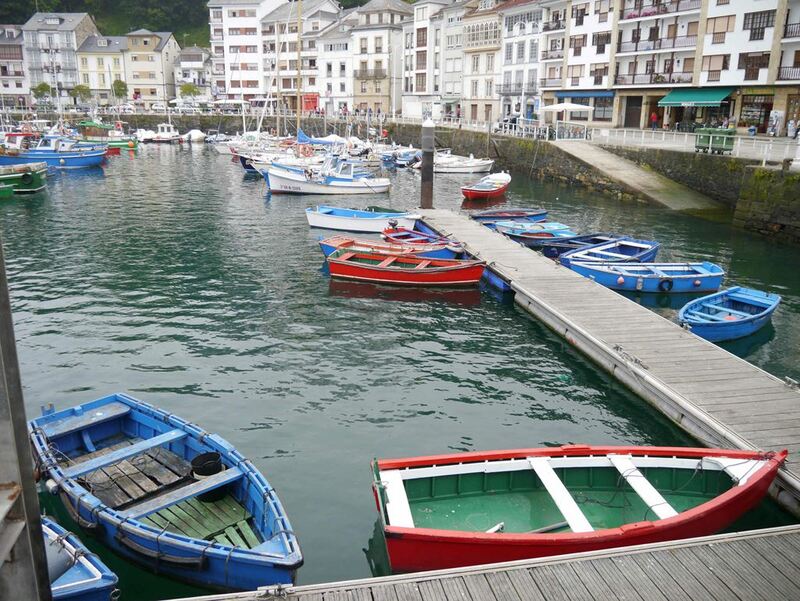 We strained our necks to see the catch in the fishing boats as we ate some great steaks with Cabrales sauce – the wonderful Asturian blue cheese – delicious! 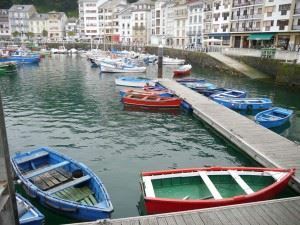 From Luarca, we went on to the beach at Otur (between Luarca and Puerto de Vega) which is a long sandy strand. We brought a picnic on the beach here but there is a tiny ‘chiringuito’ – a beach hut café – serving warmly grilled breadrolls and coffees, beers and other drinks which some of our group opted for. We had fun exploring the rock pools and caves and checking out the younger members of the group’s impressive sandcastles – while others napped or read as they sunbathed and the rest took in a long beach walk. This is a stunning port village with a handful of great seafood restaurants. You can see the seafood platter we ordered below – it was delicious. We had to ask for a doggy bag to bring home the left-overs for supper. 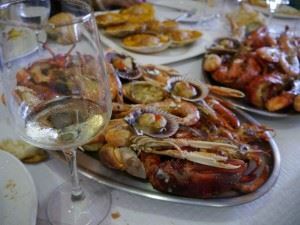 [Actually we did this most days as portions in Asturias are very generous]. From Puerto de Vega we decided to visit the Playa de las Catedrales – the Cathedrals beach – which was well worth the trip over the border into Galicia. The beach boasts huge rock structures and we loved exploring the rock caves. Some of the group didn’t roll up our trousers properly and got caught out by the incoming tide, which added to the fun! We loved this spectacularly beautiful port town – which again must have over 20 restaurants in the teeny picturesque port. We ate really well here again. We had a set menu kicking off with fabada – the Asturian bean stew, then grilled hake from the nearby waters, and finally requeson – a delicious lemon mousse made from sheep’s milk. Do not miss this steep angled town. A real gem. We wanted to go inland and see the town that was the capital in Asturias for a few years under the reign of King Silo. We saw the labyrinth stone and the statue of Silo who was just eight years on the throne. We also enjoyed the galleries or glass balconies in the main square. An interesting drive here and back as we gasped at the many beautiful colonial-style homes en route. 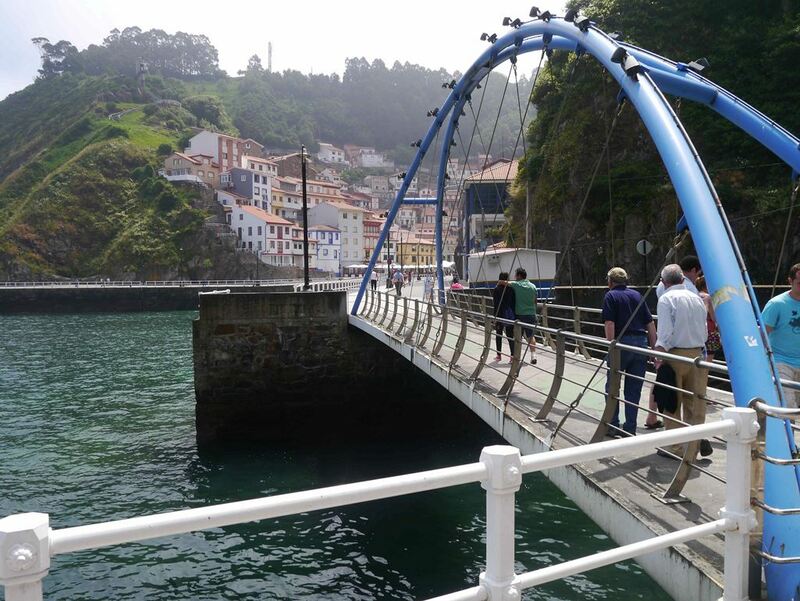 Over the years in business, Totally Spain has discovered many wonderful accommodations in Asturias and can recommend a number of stunning locations. Properties include colonial-style boutique hotels known as Casonas de Indianos as well as charming B&Bs, quality self catering and Paradores. 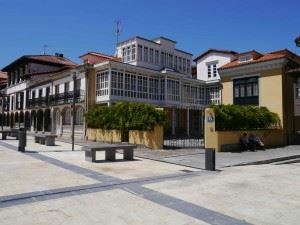 The Paradores chain has three hotels in Asturias, including the recently restored 11th century Parador Monasterio de Corias en Cangas de Narcea. Fly into Asturias Airport from Madrid and Barcelona – with additional connections in the Summer to Palma de Mallorca, Lanzarote and Fuerteventura. If you are driving from the UK, you can access Northern Spain with Brittany Ferries and arrive into Santander or Bilbao. 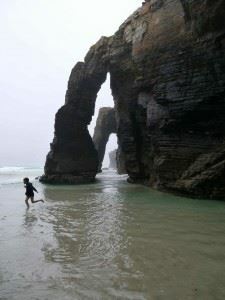 If you’d like more ideas on what to see in Asturias, see our suggested Seven Day Tour of Asturias. If you’d like to know more about the North of Spain, read our guide here. 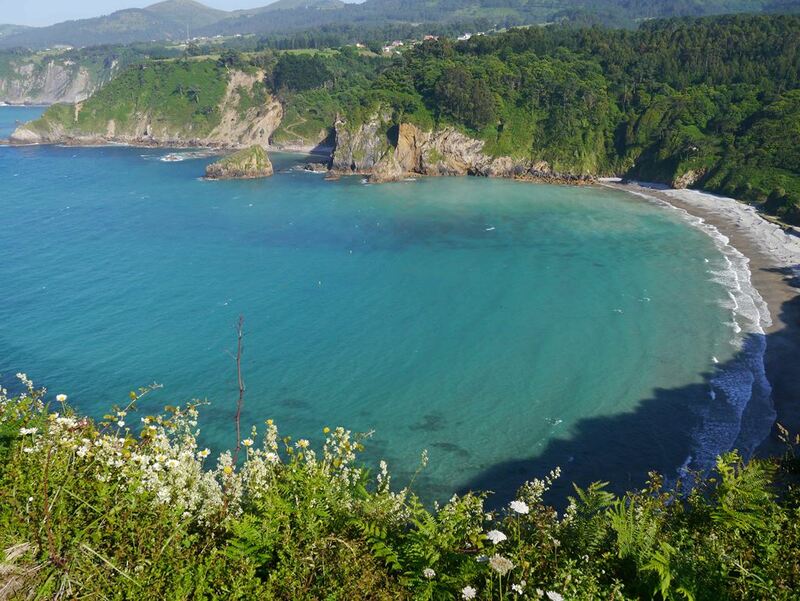 Posted in Accommodation, Asturias, Beaches, Caves, Family Breaks, Food & Drink, Galicia, Getting Around, Green Spain, Insider Spain Guides, Paradores, Spain and tagged Asturias, beaches, Cabrales, Cadavedo, Cudillero, fabada, fishing port, horreos, Luarca, Otur, Parador de Corias, Playa de las Catedrales, Pravia, Puerto de Vega, Regalina, requeson, seafood, villages.